A great website resource called History from Headstones allows you to search the largest collection of online gravestone inscriptions in Northern Ireland. The History From headstones database contains over 50,000 inscriptions from over 800 graveyards in counties Antrim, Armagh, Down, Fermanagh, Londonderry and Tyrone. Graveyards are outdoor museums and the most accessible source for studying the local community and its history. History from Headstones shows you how to find out more about the graveyards of Northern Ireland through case studies, maps and photographs. You can find out useful background information to aid your ancestral search. When clicking on the map link to a searched gravestone or graveyard you are given a little table denoting which religion the graveyard belongs to. This can be invaluable when searching parish records and archives and gives you a small window into the lives of your forebears. Many gravestones also have interesting stories to tell. Who was the woman who lived once and was buried twice? Why was a Portuguese sailor hanged in Belfast in 1810? Where are the resting places of the men and women of 1798? What do the strange carvings on some gravestones really mean? History from Headstones explores the many interesting stories behind gravestones and their inscriptions. One of the central aims of the website is to highlight the importance of gravestone inscriptions as historical sources that can be used to study the past. With this in mind they have gone through their holdings of gravestone recordings and where possible categorised the inscriptions by theme. These themes are divided into sub-categories which can then be searched. Short essays draw attention to the more interesting inscriptions within each theme. Credit is required to gain access to view a full inscription record and costs 4 Credits. However, members of the Ulster Genealogical and Historical Guild (the membership association of the Ulster Historical Foundation) now have unlimited access to the database of inscriptions via the Member’s Area. For multiple searches or if you are unsure who or which graveyard you are looking for, this may actually be a cheaper option. 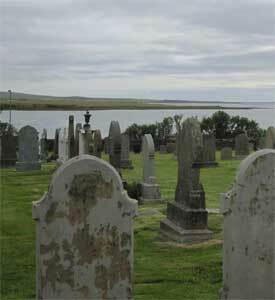 Visit the History From Headstones website. Ulster Genealogical and Historical Guild at www.ancestryireland.com.